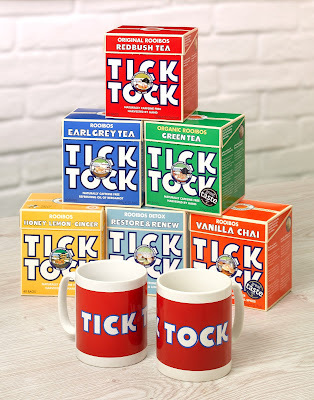 Well it's about time for another great giveaway for you lot, my lovely readers, and this time there's some fab Tick Tock teas and two mugs to be won! I love a good cuppa myself and Tick Tock have 6 different varieties to choose from. Luckily for you all you can win a box of each, hurrah! Here's a little bit about Tick Tock tea: "At Tick Tock, we’ve been growers and producers of Rooibos tea for a long time, over a hundred years, but we’re still a family concern, now in the fourth generation. In fact, we’re proud to point out that it was our Grandfather Benjamin Ginsberg who first perfected the brew in 1903. A tea pioneer, he was the first to use traditional tea making techniques to cure the wild Rooibos plant and bring out the best of its natural flavours." So to be in with a chance of winning simply enter via the rafflecopter widget below. 66 comments on "Giveaway: Win 6 Boxes of Tick Tock Tea & 2 Mugs"
Depends on time of day. Builders in the morning, green tea in the afternoon. Love Vanilla Chai :-) Brilliant competition :-) Thank you ever so much. I really love Vanilla Chai! It's my favorite :) Thanks for this awesome giveaway! Red Bush all day every day!! Redbush is my favourite tea and I almost always choose TickTock. There's a packet in my cupboard right now! My favourite flavour is green tea. Tick Tock green tea is lovely!